For my week to host Project Pastry Queen, I picked the lightest recipe in the entire cookbook: Prosciutto Tostadas with Shrimp and Parsley. 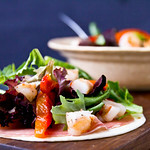 A crisped flour tortilla is topped with prosciutto, mixed greens, roasted red bell pepper strips, and a garlicky and lemony shrimp mixture. It’s an easy recipe that comes together very quickly. And it’s one of those perfect light Sunday lunches to help you recover from an overindulgent Saturday dinner. You know the kind, where everything – including the plate – seemed to be battered and fried. Check out how the other Project Pastry Queen members whipped up the tostadas and stay tuned for next week when Blackberry Pie Bars gets a cherry season makeover! A quick and easy light lunch. Just add a glass of white wine! Heat olive oil over medium heat in a saute pan. Season the shrimp with salt and pepper and add to the pan. Add green onions and garlic, cooking 1-2 minutes, until the shrimp is opaque. Place the tortillas on a baking sheet very lightly sprayed/brushed with oil (just to prevent sticking). Cook 6-8 minutes, until toasted and crunchy. 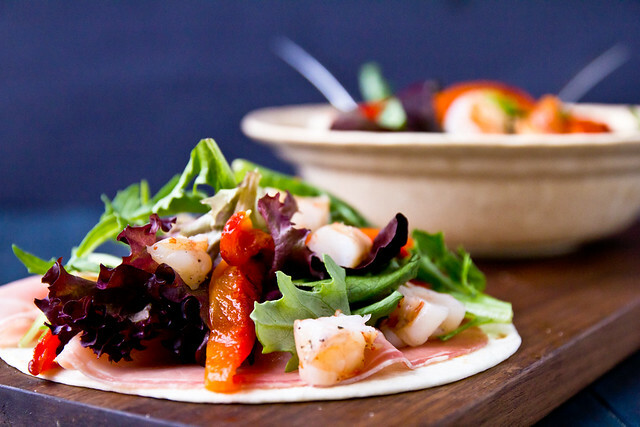 Assemble the tostadas: Place a tortilla on each of 4 plates, top with 2 slices of prosciutto, 1/2 cup salad greens, and a generous scoop of the shrimp mixture. Arrange bell pepper over top and serve immediately. Really creative to incorporate prosciutto! Your photo looks wonderful! I’m trying blueberries for next week. I hope it comes out great. Lighter fare like this always feels so good in the summer! Yum! These look delicious – and like the perfect, light summer dish! The suggestion of white wine sounds delightful too! I found that it was tastier to chop and fry the prosciutto.